“Jacob was left alone; and a man wrestled with him until the breaking of the day.” (Genesis 32:24). Wresting with an Angle is a daunting task. 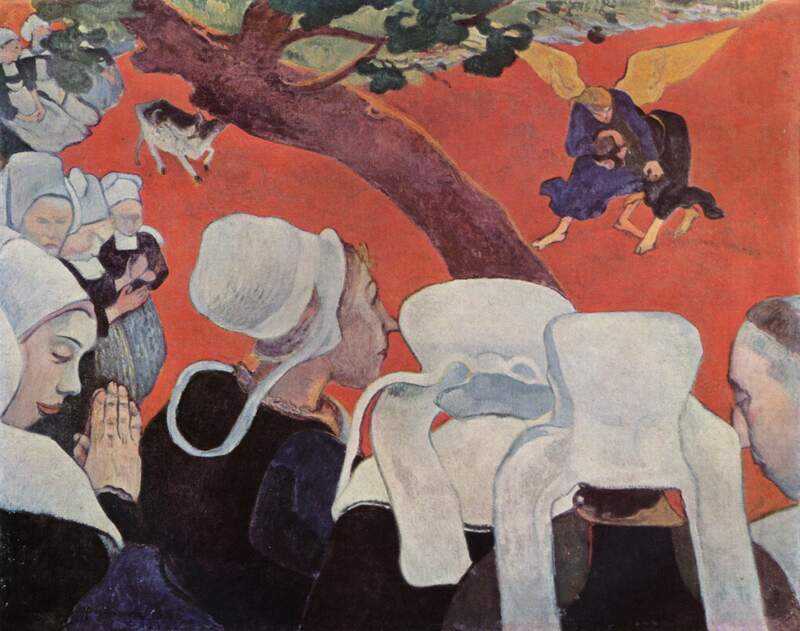 Unlike this Gauguin painting depicting Jacob wrestling with an Angle before a crowd of people, most wrestle with an Angle in solitude. The Angle may be an Angle of Light or Angle of Darkness. Both are formable; both spiritually wrestle with the soul; both leave behind a soul changed forever – “Jacob’s thigh was put out of joint as he wrestled with him” (Genesis 32:25). A minor wrestling match that lasts but a few seconds is as formidable as a match that lasts through the night till dawn. The opponent is just as arduous and still leaves behind a permanently changed person. The little way of St. Therese of Lisieux exemplifies many minor wrestling matches that strengthens and glorifies the soul by performing small acts of love for others, even the most difficult of personalities, in union with God. Minor wrestling matches can also include encounters with the evil one who continually attacks the soul. Like water that penetrates the smallest of cracks in rock to expand the small crack to a fissure and then ultimately fracture the rock. So too does the evil one penetrate the soul to separate the soul from God and lay claim to it forever. For this reason it is important be forever vigilant. Do all for God and in union with God. If not, the evil one will exploit a crack within the soul until the soul is separated from God, forever. This entry was posted in Essays, Meditations On Biblical Verses, Uncategorized and tagged Angle of Darkness, Angle of Light, Catholic, Catholicism, Christian., Christianity, Genesis 32:24, Genesis 32:25, Jacob, St. Therese of Lisieux, The Little Way, Wresting with an Angle. Bookmark the permalink. I speak to the angle and ask her/him what is your name and to show God to me. Thank you for posting Jacob and the wrestle with the angel.